Max Forbes was the consummate graphic designer. A natural exponent of Robert Pirsiq’s ‘quality’ principle, he brought to his life and work an unerring rightness. His approach was all encompassing. The clothes, the food, the wine, the car, the corporate identity – all were one to Max. If they did not celebrate the highest quality, then they did not exist. He drove a Bentley. Max Forbes was born in Melbourne on 6 July 1923. He was educated at Scotch College, Melbourne, and was married to Margaret Turnball. 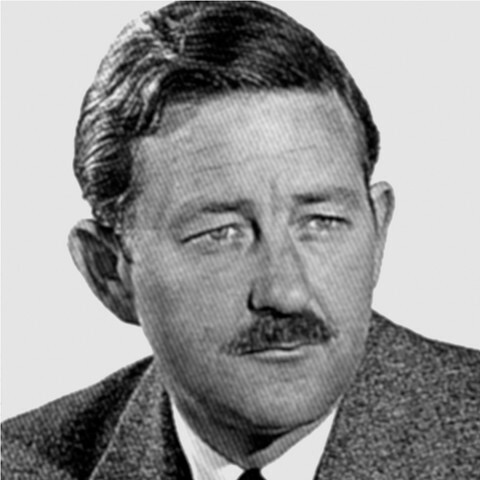 During World War Two, he joined the Royal Australian Army and was involved in aerial mapping over Western Australia. After the war (1947) he studied Industrial Design at the Royal Melbourne Technical College. His first job was with Patons Advertising. Max Forbes was one of the founding members of the Society of Designers for Industry, formed in 1947. This was the first professional body of industrial designers in Australia. The aim of the society was to assist industrial designers to establish the same kind of professional status enjoyed by other organised professions. Other founding members included Fredrick Ward, Richard Haughton James, and Grant Featherstone. They hoped to improve standards both of and for designers and above all to create among the buying public the desire to understand and possess well designed goods. In 1960 Forbes was elected to the Council of the Society. The Society later became the Industrial Design Institute of Australia (IDIA). Between 1948 and 1950 Forbes worked for Richard Haughton James in his studio on Collins Street, Melbourne. Forbes worked with James on the exhibition design for the Red Cross Modern Homes Exhibition in 1949. This exhibition was highly praised as being the finest example of exhibition design seen in Australia. Max Forbes left Richard Haughton James’s studio to travel overseas in 1951. He did some freelance work, in London, such as exhibition stand design for Mullard Radio. He also travelled in Europe, particularly Switzerland and Scandinavia. While overseas, Forbes collected advertising posters from around Europe. He also met Peter Clemenger, from the John Clemenger advertising agency. Upon his return to Melbourne, they collaborated on organising the Exhibition of International Advertising Art in 1953. The aim of this exhibition was to show Australians overseas advertising and help promote similar standards here. Max Forbes’s exhibition design was again highly praised. Forbes set up his own freelance design business and worked on a variety of different commissions. His work included exhibition design, industrial and graphic design. His versatile designs ranged from furniture to street decorations to artwork for advertisements. The 1956 Olympic Games in Melbourne created a great deal of work for Forbes. He designed the poster “Melbourne – Olympic City” for the Victorian Promotions Committee to advertise Melbourne to Australian and overseas visitors. The bold, flat poster colours and the comical central figure show that Forbes was influenced by the posters he had seen in Europe. Forbes also designed street decorations for Melbourne during the Olympics. And he was the exhibition designer for the Graphic Arts Exhibition which was part of the Olympic Games Arts Festival. In 1957 Forbes won third prize for Best Poster of the Year – 24 Sheet Section in the Outdoor Advertising Association’s competition, for his advertisement for Viscount Cigarettes. In 1958, Forbes designed an exhibition for the company British Nylon Spinners to commemorate the opening of their new spinning plant. The exhibition showed the latest in nylon fabrics. As well as the exhibition Forbes also designed a range of associated material such as posters, invitations, leaflets and a booklet on the company. Max Forbes was one of the seven designers selected by the Reserve Bank to be on the currency note panel. This panel was established in 1963 to design the new decimal currency. It comprised seven graphic designers and Russell Drysdale. Forbes developed a series of designs for the notes, and continued in an advisory role once Gordon Andrews designs were selected. In 1963 Forbes also created street decorations for the Queen’s visit to Melbourne. His design included three large crowns which seemed to float above the street. His decorations received praise from the media at the time and were described as being “in the best of taste”. In that year Forbes also created street decorations for Melbourne’s Moomba Festival. During the 1970s, Forbes did a lot of work for the United Distillers Company. He designed packaging for the company, which involved creating bottles, caps and labels for the company’s spirit bottles. He also designed a range of furniture for the company’s boardroom. Forbes continued to work in the 1980s. One particularly large commission was artwork for the advertising campaign of Euro Furniture. He died on the 1 May 1990. He had established a reputation for design work of a very high standard. He is considered to be in the craft tradition of Australian designers. His work was always beautifully executed. Right up to the end of his career he always created his work by hand, doing his own lettering and carefully mixing his paints. Unlike the more technical approaches other designers were adopting. Many of the drawings and mock-ups held in this archive are painted or drawn by Forbes and are more like art works themselves, than rough steps in the design process. Sourced from the Powerhouse Museum Collection. Under Creative Commons License: Attribution Non-Commercial.